Editing is a difficult skill to master, but an important skill to have. Such a tool set is as useful for the reviewee as it is for the reviewer. No one is a perfect writer, and no one can analyze their own work with a perfect level of objectivity. When you are in your own head, it is next to impossible to catch every weakness in your work. Critically analyzing writing is not an effortless task, and if done incorrectly will likely hurt your reviewee's self confidence and perhaps even reduce their drive to continue writing. 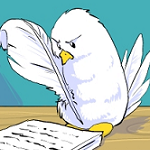 Here we will cover elements of strong editing based on own experiences as writers and reviewers for the Neopian Times. These findings can be applied to your own work as much as they can to your editing partner's and ultimately lead to stronger pieces from both parties. Many writers have received peer "reviews" with a few commas added, perhaps even a quotation mark or two for luck, but little to no critical commentary. This sort of feedback is not literary editing. Proofreading involves searching for and correcting misspellings, grammatical errors, and awkward or improper sentence structure, among other issues. Proofreaders are the technical gurus of the English language. Rarely do they look beyond the surface issues of a piece's writing, and even more unusual are proofreaders who point out big picture problems such as story continuity. Don't get us wrong, a good proofreader is as necessary as a good editor. Minor grammatical tics in one's writing have a tendency to build up and an error-ridden story is as likely of a candidate for rejection as one with an inconsistent storyline. Even so, a well-polished piece requires outside analysis of larger issues within the prose and content. And remember, a skillful editor can also be a solid proofreader just as much as a proofreader can excel as an editor, but good writing ultimately requires both. The ideal editor will have a strong sense of what belongs in a solid story. Plot, setting development, and character development are all crucial aspects of a narrative, especially a long-form narrative such as a series. The editor should be constantly on their toes, watching for any weaknesses, inconsistencies, or errors in the storytelling. Pay close attention to believability in dialogue, proper (or improper) use of detail, pacing, and making sure character arcs are followed through. For more detail on what makes a good story, we advise searching back issues of the Times, as many excellent guides on how to write a story (or an article) have been published over the years. Those who read a lot of narrative prose will also begin to develop an innate sense for good storytelling that will serve them well in this area. No two people will write in the same way. Do not prevent a writer from telling their story their way unless there is an actual weakness to be addressed. Kanrik, head of the Thieves Guild, inexplicably being a yellow Chia in a story is completely erroneous to his on-site portrayal and should be pointed out to the writer. Kanrik's favorite food being Chips and Curry is a matter of personal interpretation and has nothing to do with the inherent literal quality of the work. Avoid commenting on elements of a story's content that you find disagreeable simply out of personal opinion. With that being said, keep in mind the tone of the writing. If it is a humor piece about someone using Chia Flour (a Battledome item that transforms one's opponent into a yellow Chia) on Kanrik, that is a very good reason for him to change species and colour. Likewise, many people enjoy spoofing Neopian characters and plots. Try not to be offended if their goofy portrayal of Dr. Sloth is not the almighty villain you like to picture him as. A good rule of thumb in this area is: analyze how well the writer got their ideas across, not how much you liked their ideas. This holds true on a prose level as well. Do not comment negatively on someone's prose structure simply because it is not what you are used to reading. Many writers shift into a slightly different voice when writing, especially if they are telling the story from a certain point of view or wish to imbue a certain tone to their scene. Different writing is not incorrect writing if it is still technically sound and clear to read. No matter the editor's personal opinions about the piece, objectivity and professionalism are the keys to crafting helpful commentary. By this we mean that one must keep themselves out of their critique as much as humanly possible and treat their fellow writer as a respected peer, no matter their skill level. Keep yourself detached. Your emotions should hold no sway over the words that you choose. Furthermore, all writers will take pride in their work. That is, after all, why they seek peer review: to improve. If the writer's personal feelings are ignored, they may take to heart the editor's personal feelings about their work. In worst case scenarios, some writers may even quit altogether. Honesty is the best policy. Be tactful with your word choice, however, especially if the subject seems particularly touchy. Nonetheless, if you think a part of their piece needs work, let them know. If they are not informed by you, someone else will tell them later. Or worse, their only feedback on the matter may be a rejection letter. Save them the trouble now and you will be doing a huge favor for them in the long run. For a majority of the people reading this article, the Neopian Times receives the bulk of - if not all of -their creative attention. Some, such as Carolyn, hope to practice their craft enough to break into the professional writing world. There are, however, plenty of Neopian Times participants that are casual writers, those who write simply for the joy of writing. Others are already professionals, but enjoy the Neopian Times as a creative outlet in their spare time. With that being said, unless a writer specifically asks that they wish to be edited at the professional level, do not approach the editing task as such. The standards for acceptance into the Neopian Times are purposely set lower than publishing standards in the professional editing world. Keep that in mind as you work. In most cases, the writer whose work you are editing is not trying to write the Neopian equivalent of a best-seller. It is unwarranted to crack down on them with a higher level of critique than they might be able to handle at this point in their writing career. The road to being an acclaimed writer is one taken with baby steps, and feeding the inexperienced or casual writer a comprehensive list of everything minutely wrong with their work may only serve to overwhelm and discourage them (as well as make them hesitant to get their work edited in the future, which would be a huge mistake). Unless a writer tells you that they want you to tear their work apart, approach an editing project with the attitude of giving the writer an overview of what they can look out for without pointing out every example of a particular weakness. That way, it will not continue to crop up in their writing. Receiving positive feedback can be a great reinforcement for a writer. It feels good to be told how and why a certain passage is strong, or a particular character tugs at the editor's heartstrings. Beware, however, that all writers—even our idols—have places where their writing needs to improve. Receiving mostly positive comments can mean that a particular piece is strong, but there will always be topics that were not included in a critique. It does not necessarily mean these parts of your writing are weak, but that they did not stand out as much. Celebrate the successes of your writing, but pay attention to what is unsaid. For those are areas that, while good, could be polished more in order to shine. Editors are human. Not every statement or opinion about your work will be correct. If you disagree with an editor, let them know, but do it tactfully. They did, after all, just spend hours poring over the details of your piece. Some of the best rebuttals clarify the purpose of a section or a character's actions. This can quickly become a conversation on its own, where editor and writer can bounce ideas back and forth about the clarity of a section or ways in which improvements could be made. Keeping in correspondence with your editor is extremely important in this regard. It is better to solicit critique from someone whom you know you can keep in touch with, rather than someone who will dash off after a few paragraphs and then never talk to you again. The old saying, "You are your own worst critic", is often true. There are, unfortunately, some critics out there who aren't much gentler. Don't let their voices - or your own - sway you from something you love doing. Getting a particularly harsh critique does not mean you are a bad writer, or that you should stop trying. After all, our editors have received their fair share of negative feedback as well. Good writers are the ones who never gave up. So long as you enjoy what you are doing, keep trying. You'll be amazed what you can do. In the end, as a writer, you are entitled to your own creative vision. While the way you get your ideas across can always be improved, your ideas themselves have the right to be respected. Take the critique that you think works, and leave what you think does not. And avoid molding your work to please other people. Even if it sounds "good" to them, you will be far less satisfied with it. Editing is just as important a part of the writing process as writing itself, and editors deserve far more appreciation than they often receive. It is our hope that this article will help editors hone their craft, help writers understand the editing process, and help writers and editors learn how to work with each other better. Note from the authors: Looking for more information on editing or a beta reader for your story? Try asking at the "Neopian Times Writers' Forum", a recommended fansite. This hungry Zafara got more than she bargained for at the fishing hole. "So that's when the Space Fungus started swarming our ship!" They had to have been walking for at least an hour, now, but Hyren was nowhere near running out of stories.